John Bothwell builds brand-new Bugattis to 1927 specifications, right down to the leather engine parts, so you know he’s got style. He also drove one across the U.S., the long way, so you know he’s insane. But after watching his brainchild Bug’ roll around SoCal I’m starting to think he’s on to something. Friend of Jalopnik and host of The Smoking Tire Matt Farah knows Bothwell from that time they took a little off-road adventure together. 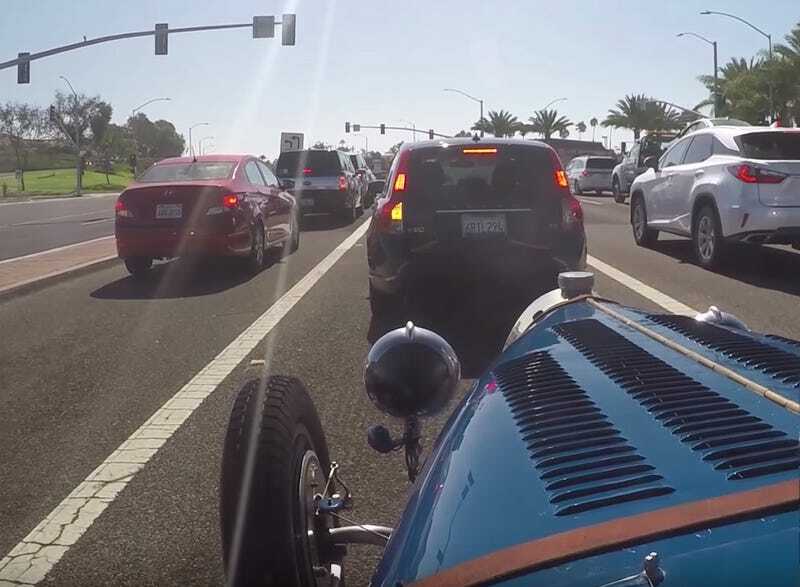 In a Ford Model T.
Bothwell is obviously a special kind of car guy, creating piece-for-piece recreations of the Bugatti Type 35 Grand Prix racer at his shop PurSang. The new cars are made out of the same stuff as the old cars with only two exceptions I noticed in the video: a modern tire compound, and a radiator fan so the car can survive a few red lights without boiling over. This particular car was built a year ago in Argentina. True to the original design, the engine is part of the car’s structural integrity. The “lateral chassis support is the lower crankcase,” says Bothwell. He says the car weighs 1,600 pounds and its supercharged engine is good for 140 horsepower. That’s a pretty tidy ratio and should make for a quick car, even if it is on leaf-spring suspension. “You close your eyes and you think you’re driving a Porsche, like a 911...” he tells Farah, preparing him for the Type 35 experience. So presumably Bothwell has not driven a Porsche 911 or has access to some superfly drugs. I’ll add an update if we figure out which one it is. Farah quickly falls under the car’s spell too: “STRANGELY ENOUGH ASIDE FROM THE REVERSED GEAR PATTERN, IT’S ACTUALLY PRETTY NORMAL,” he yells over the bombardment of wind and engine noise, coddled in Bothwell’s arms as a ‘casual spoon’ is the only physical way for two grown men to occupy the Bugatti. I don’t know if I’d be brave enough to take one of these on a 4,200 mile road trip, but I can definitely appreciate what Bothwell is building here. As far as I’m concerned more wind means more fun, and there’s no school like old school. Except when you want to be comfortable, quite or safe.